Welcome back, little architect! Zootown citizens have no place to live in after their homes have been destroyed by a tornado. 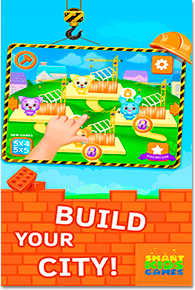 Now animals need your skills and talent of a builder! Only you can design and build houses for these fluffy citizens! Create a beautiful world for them and save the whole town! What are you waiting for? Go to a construction site, select and combine craft blocks, choose doors, windows, rooftops and many more. Build a tiny farm house, luxurious mansion, majestic castle or a haunted house. Animals from Zootown will be very grateful to you! Use imagination – there’re no limits in this game! 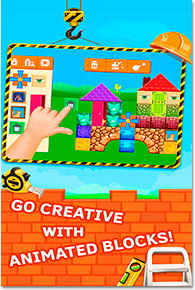 Chose various construction materials – everything from simple bricks to rather unusual elements like cheese or pudding blocks. Go creative! Don’t like the constructions you have built? Start it over! 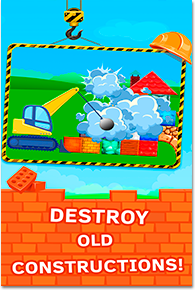 Launch nature disasters, destroy old constructions by a tank or blow buildings up and build everything from the ground up. Each level is your playground – build whatever you want. Nothing is predetermined! Everything goes by your rules. * Loads of construction materials make everything possible. How about a stylish cake house or a breathtaking waffle skyscraper? Create anything you want! * Interface and touch controls are specially designed for toddlers and preschool children 1 – 4 years old. 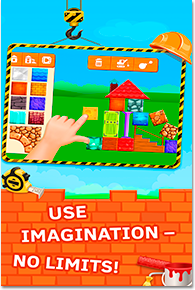 Download this free building game now and prove that you're the best architect!